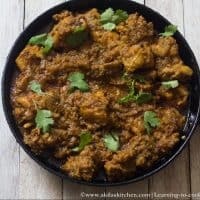 Karaikudi chicken fry is a special chicken fry recipe of Karaikudi district and tastes delicious with the freshly ground masalas and Indian spices. 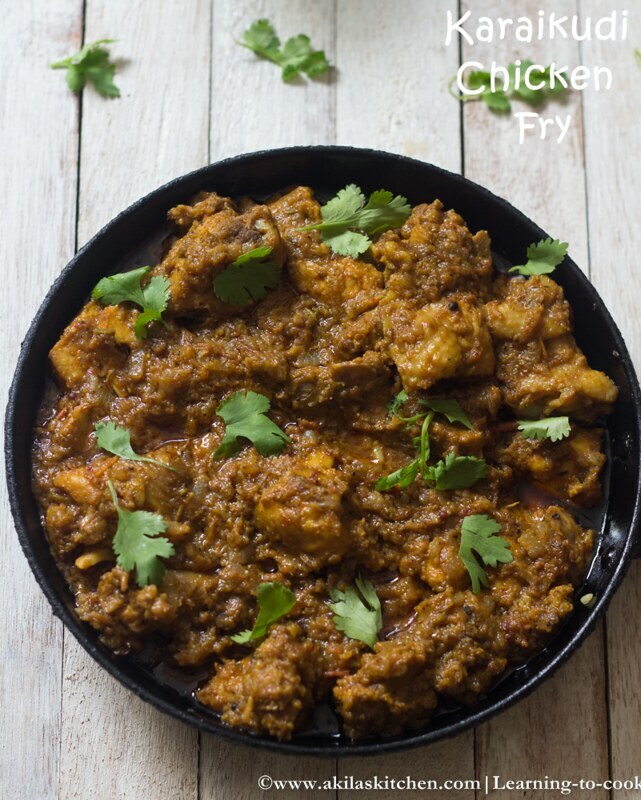 Karaikudi chicken fry recipe with easy step by setp instructions for your easy understanding and learning. 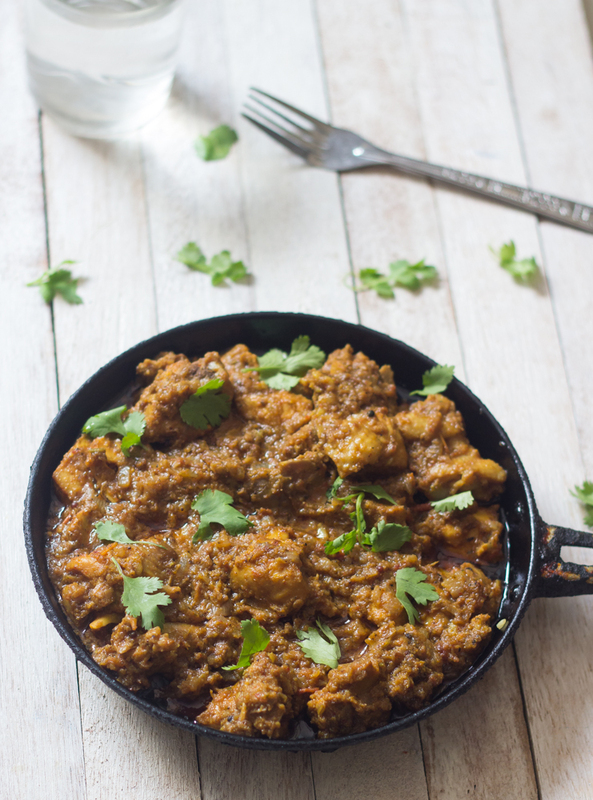 I did not prepare any chicken dish for many days and my hubby asked me for a yummy chicken dish. So I prepared this Karaikudi Chicken Fry taken from here. Though it is a fry, I tried it as a gravy one as we can have it for chappathi or roti at night. So for a fry, add less onions and tomatoes. You can also try different Chicken recipes below. 1. Wash the chicken pieces nicely with salt. 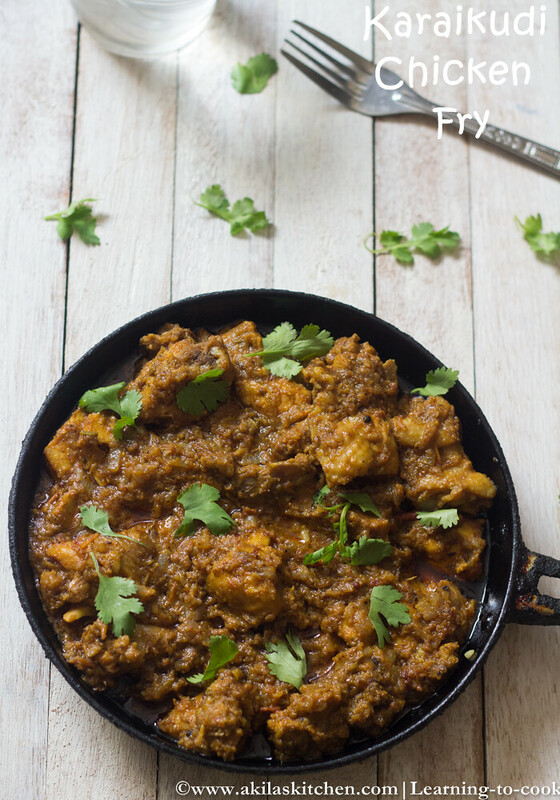 Marinate the chicken pieces with turmeric powder, chilli powder, salt and lemon juice for 40 min at least. In a kadai or pan, add 1tsp oil and fry the red chillies, coriander seeds, curry leaves, cinnamon stick, cloves, pepper, bay leaf, fennel seeds one by one. 2. Finally add the grated coconut and fry for a min. Allow to cool and grind to a smooth paste adding little water. 3. In the same kadai, add the oil and when hot, add the mustard seeds and when it got splutters, add the fennel seeds and cumin seeds. Add the onion and saute well. 4. Add the garlic and tomato and ginger paste. Saute till the tomato becomes mushy. 5. Add the coriander powder and saute again. Now add the ground paste from step 2. 6. Add required water and allow it to cook. 7. Add the marinated chicken pieces and again cook adding little water. (Chicken leaves out water while cooking). 8. When the oil starts oozing out from the gravy add the coriander leaves. Give a stir and switch off the stove. 9. 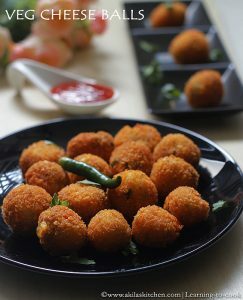 Serve it with hot rice or any roti or naan. 1. 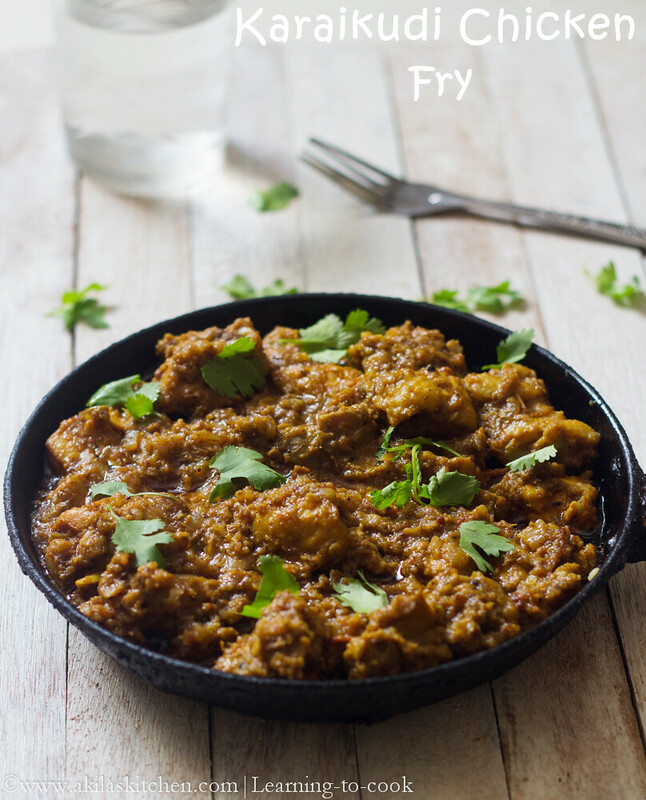 This fry can be made as semi gravy or gravy by adding less or more onion and tomato. But while adding check for the spiciness and salt. Wash the chicken pieces nicely with salt. Marinate the chicken pieces with turmeric powder, chilli powder, salt and lemon juice for 40 min at least. In a kadai or pan, add 1tsp oil and fry the red chillies, coriander seeds, curry leaves, cinnamon stick, cloves, pepper, bay leaf, fennel seeds one by one. Finally add the grated coconut and fry for a min. Allow to cool and grind to a smooth paste adding little water. In the same kadai, add the oil and when hot, add the mustard seeds and when it got splutters, add the fennel seeds and cumin seeds. Add the onion and saute well. Add the garlic and tomato and ginger paste. Saute till the tomato becomes mushy. Add the coriander powder and saute again. Now add the ground paste from step 2. Add required water and allow it to cook. Add the marinated chicken pieces and again cook adding little water. (Chicken leaves out water while cooking). When the oil starts oozing out from the gravy add the coriander leaves. Give a stir and switch off the stove. This fry can be made as semi gravy or gravy by adding less or more onion and tomato. But while adding check for the spiciness and salt. *post first published on Feb 8th 2015. Updated with recipe. I like this delicious gravy version. Will be divine to be eaten with rice.